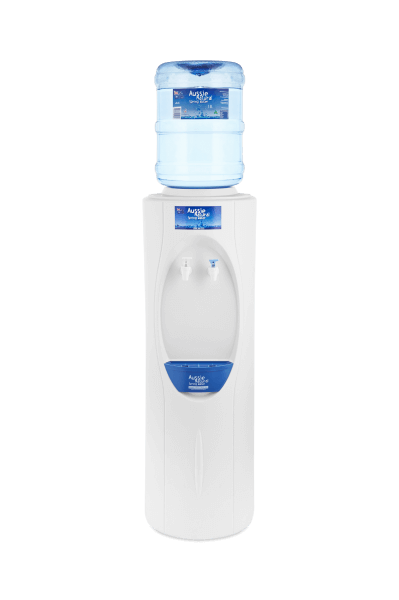 Aussie Natural’s standard Cool & Cold water cooler dispenser is an attractive, easy to use unit and most popular dispenser in the market. This unit offers chilled spring water – for the long hot summer days, and cool spring water for room temperature drinking, cooking and food preparation. Water cooler rental from $99 Per Annum (Incl.GST) + Receive 3 x 15L Aussie Natural Bottles & Businesses will also receive a free cup holder and sleeve of cups! Looking for a quick and easy way to provide Aussie Natural Spring Water to your family, friends, or colleagues? Our specifically designed Aussie Natural Cool and Cold Water Cooler can make it quick and easy! Our simple aesthetic is suitable for any home or office, and our standard cool and cold water cooler has a built in cooler regulation system- so that the temperature is always just right. A long summer day in West Australia only seems longer when you’re stuck at the office, with your temperature rising as the sun beams down. Rehydrate and revitalise, with fresh cold water from our Aussie Natural dispenser, chilled and ready whenever your thirst hits. Whether you’re preparing food, or thirsty for a glass of fresh, pure spring water, our multi-faceted water dispenser can help. Tap water is suitable for washing up, but when you’re consuming water you want to be sure that it’s free of any nasty chemicals or hidden pathogens. Our dispenser provides you with safe, clean, room temperature spring water, so you can prepare food and rehydrate with comfort and confidence. No matter where you are or what you’re doing, our standard cool and cold water dispenser can consistently provide you with water at just the right temperature, with a clean, crisp taste that our customers know and love.